Your primer is here . . . Think the only use for mobile is "text-to-give" for donations? If you answered "YES" then you're only seeing the tip of the iceberg. For example: Mobile is an exceptional tool for donor cultivation. Because it is so personal, once you have permission to send donors messages you can build loyalty fast. Donor cultivation is just one of the many uses for mobile covered in this new report, Mobile for Nonprofits - Connecting Donors through the Power of Mobile. Do you also . . . Think that mobile is only for the large charities? Think mobile is too expensive? Think mobile is too complicated or too hard to use? Think mobile isn't worth doing because your donors are too old? If you answered "YES" to any of these questions then you need to know more about mobile. Mobile for Nonprofits - Connecting Donors through the Power of Mobile clearly shows how the correct answer to all those questions is "NO." 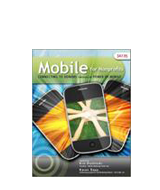 This report is a primer (a learning guidebook) for nonprofit mobile marketing and fundraising. If you don't know anything about how mobile works . . . or about the multitude of ways it can benefit your charity . . . this 45-page report will remove the mystery. It's unlikely you have time to research the topic of mobile. 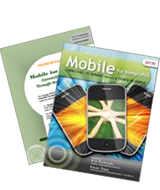 To research and acquire a working understanding of the tools, technology and trends in mobile. To find a handy glossary of terms, a sample integrated fundraising/marketing plan with mobile, and a list of resources. No need to spend your precious time on research because we did it all for you. And now it's available in one place. Mobile for Nonprofits explains the fundamentals, and gives dozens and dozens of creative ideas on how to integrate mobile into all your existing fundraising and marketing campaigns. It's a valuable resource whether you are brand new to mobile and find it overwhelming, or you already have a head start on how it works. You won't find examples from the for-profit sector with the phrase, "Oh, and this works for nonprofits too," tacked on. Quite the opposite. Every example, story and illustration is specifically for nonprofits. The only intended audience for our report is professionals like you that are responsible for the fundraising and marketing. 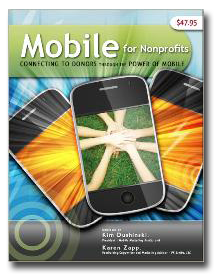 For more information you can click here to view the Table of Contents and Foreword of Mobile for Nonprofits - Connecting Donors through the Power of Mobile. The report (primer) is loaded with valuable information and resources. But we soon discovered that many of you need a bit more. By adding the "premium supplement" you receive help in overcoming the main obstacle that keeps most professionals from implementing mobile. What is this obstacle? One of the critical decisions you'll face is choosing the right mobile–savvy vendors to work with your nonprofit. Yet you're already spinning lots of plates - wearing multiple hats - juggling several overlapping deadlines - and generally pressed for time. Do you have time to figure this out too? That is … How to choose vendors? Plus you're naturally concerned about making the wrong decision. Unfortunately this is far too easy to do. Why? Because as someone new to mobile you probably don't even know what questions to ask in order to determine if a vendor is the right match for your charity. Now you do. In Mobile for Nonprofits we identify, define, and discuss the four primary vendors you'll potentially work with on your mobile campaigns. 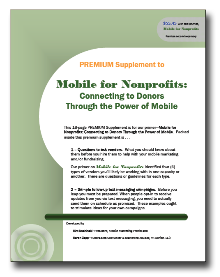 And in the premium supplement of Mobile for Nonprofits we give you the questions to ask. These are questions that will help you determine if the vendor is qualified to work with you, and if qualified then do they have all the capabilities your nonprofit requires. In fact there are 17 pages of questions, tips and guidelines for choosing the right vendors for your nonprofit. Here we clarify even further who the players are, their roles, and how you work with them. Plus there are some suggested vendors. Another stumbling point for many nonprofits is knowing what to say in the text alerts to donors, members and prospects. Once someone agrees to receive updates you need to deliver on your promise. Mobile is still relatively new so we help you figure out what to include in these messages with more examples. Examples and ideas to stimulate your creativity. We make everything even easier for you in the premium supplement of Mobile for Nonprofits. You may choose the primer alone, or the primer AND the premium supplement. Details below. YES! I understand that Mobile is dramatically changing the way nonprofits connect and interact with donors! I don't want to miss out! 1. All Payments are in US Dollars. 2. Clicking the "Buy Now" button will take you to our shopping cart at Mobile Marketing Profits. P.S. Can your nonprofit afford to exclude mobile from your fundraising and marketing? There are so many ways to help your nonprofit through mobile. And you can be up and running in no time at all! Really. Thank you! And have fun with mobile as you strengthen your fundraising and marketing campaigns. Want to know more about who wrote this extensive report (primer)? There are two authors combining their experience and expertise to help further your mission. Karen brings the "nonprofit" and Kim brings the "mobile." Karen has been writing fundraising copy - offline and online - for over five years for medium to large nonprofits (regional, national and international), along with some smaller organizations. Plus she publishes a newsletter - ZAPP Nonprofit Leader - twice a month; and also has a blog. Both publications focus on how to write stronger nonprofit copy, building donor (or member) relationships, and the importance of doing both well through a multi-channel strategy. She is a speaker and publisher of products for nonprofits. Kim Dushinski is the author of the best-selling book, The Mobile Marketing Handbook: A Step by Step Guide to Creating Dynamic Mobile Marketing Campaigns. She is the president and founder of Mobile Marketing Profits, a marketing firm that provides mobile marketing education and consulting services to corporations, marketing professionals and entrepreneurs. As an advocate for smart, effective mobile marketing she leads workshops and speaks internationally about how to profit with mobile. Kim is a successful entrepreneur with over 20 years of experience in sales and marketing as a Marketing Director at a travel agency, desktop publisher, business marketing consultant, an Internet marketer, and partner in a book publicity firm.